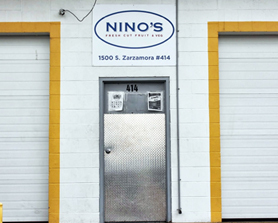 About Nino’s Fresh Cut Fruit & Veg. Nino’s Fresh Cut Fruit & Veg. Nino’s Fresh Cut Fruit & Veg. 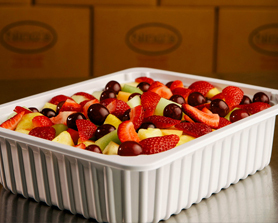 has delivered fresh, safe, and high-quality produce to the South Texas region for over 25 years. Each day we come into work, we continually strive to provide the freshest produce possible. Our company is built upon strong family values, and is deeply rooted in providing excellent customer service, honesty, and a level of standards that surpasses any customer expectations. We serve our distributor partners by working closely with them to provide the most cost-effective loads and schedules possible. Our commitment to our partners is built on trust and transparency. Our state of the art facility is designed with food integrity and safety as the primary focus. Nino’s Fresh Cut Fruit & Veg. has over 10,000 square feet of computer monitored cold storage space that is zoned independently in order to match the right temperature with the right products, producing the ideal climate for each commodity. We are a PrimusLabs certified facility and have the Superior rating on our Processing with HACCP and Primus GFS certificates. Our HACCP plan supports an effective sanitation standard, operating procedure, and other strenuous pre-requisites. 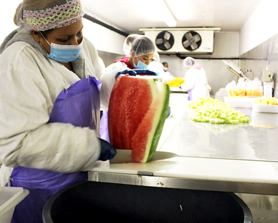 In order to prevent and stop any unsafe food from entering commerce, we believe that it is essential to obtaining full commitment and participation from all levels of personnel. We have integrated a structured Sanitation Standard Operating Procedure (SSOP) training process that provides our staff with effective ways to evaluate and measure results. Our primary goal for SSOP is to ensure our processing rooms; equipment, facilities, and grounds are continually maintained at the highest levels of cleanliness and sanitation possible. Our HACCP plan allows for the reduction and the risk of any biological, physical and chemical hazards. We not only adhere to HACCP but also the enforced governmental regulations and guidelines as well as Good Manufacturing Practices.